Saturday marks the opening of the 70th DeKalb County Track and Field Championships as the field events get underway at 10:00 am with the track preliminaries set for 3:00 pm. The first DeKalb County Track Championship was held in 1950 and including the event being the DeKalb Relays from 1959-65 has been continuously running for 70 years. This year’s boys’ title could be a tight battle as only 24 of last year’s Top 8 finishers return including Walik Robinson of Miller Grove as the lone returning gold medal winner (300m hurdles). Robinson also won the silver in the 110m high hurdles last year. Southwest DeKalb won its county record 15th title a year ago, but many of that team graduated. Arabia Mountain returns Jordan Barrow who finished second in the 100m dash and long jump and third in the 110m high hurdles a year ago for the fourth place Rams. Chamblee is the closest to Southwest DeKalb in county championships with eight winning seven consecutive titles from 1951-57. Southwest DeKalb owns a streak of 10 titles from 1989 to 1998 and has won two of the last four (2015, 2018). Stephenson owns seven titles including five in a row from 1999 to 2003. The girls’ competition for the county track title began in 1977 and Southwest DeKalb also leads the way with 11 titles including six consecutive trophies from 2007 to 2012. Lithonia follows with eight titles including run of six from 1989-1994. Miller Grove and Coach Eric Keddo have won three of the past five championships including the past two as the Lady Wolverines work to make it a three-peat this year. The girls’ meet has 39 returnees that finished in the Top 8 a year ago, including seven gold medal winners. 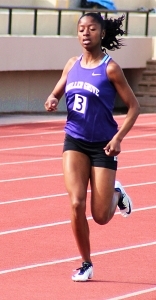 Miller Grove’s Emoni Coleman is vying to make it a clean four-year sweep of the 800m run and 1600m run titles having won both the past three championships (2016-2018). Martin Luther King Jr.’s Kayla Hunt is the defending champion in both the 100m and 200m dashes and was part of the gold medal winning 4x100m relay team for the Lady Lions. Arabia Mountain’s Patra Williams is set to become a three-time champion in the high jump having won in 2017 and 2018. Other returning gold medalists include Cedar Grove’s Antonia Swain (discus) and Lakeside’s Emma Hanson (3200m run). Monday’s track finals are set for a 5:30 with the girls and boys 4x100m relays to kick off the second day of competition.